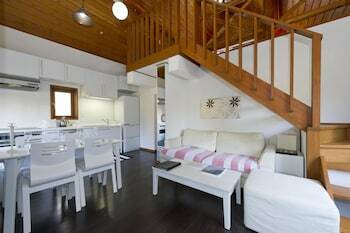 Located in Kutchan, this apartment is within a 15-minute drive of Niseko Mountain Resort Grand Hirafu and Lake Hangetsu Nature Park. Featured amenities include laundry facilities and a safe deposit box at the front desk. Free self parking is available onsite. With a stay at Suzuya Konnichiro in Kaga, you'll be within a 15-minute walk of Korogi Bridge and Kakusenkei Park. Free self parking is available onsite. With a stay at Hotel Route-Inn Hanamaki in Hanamaki, you'll be within a 10-minute drive of English Beach and Hanamaki City Museum. Free self parking is available onsite. With a stay at SAMURAIS HOSTEL Ikebukuro, you'll be centrally located in Tokyo, within a 15-minute drive of Tokyo Dome and Imperial Palace Garden. With a stay at Palace Studio Ginza Itchome in Tokyo (Ginza), you'll be within a 5-minute drive of Kabuki-za Theatre and Tsukiji Fish Market. With a stay at Yumoto Shirogane Onsen Hotel in Biei (Shirogane Onsen), you'll be steps from Shirokane Hot Spring and 3 minutes by foot from Shirahige Falls. Free self parking is available onsite.